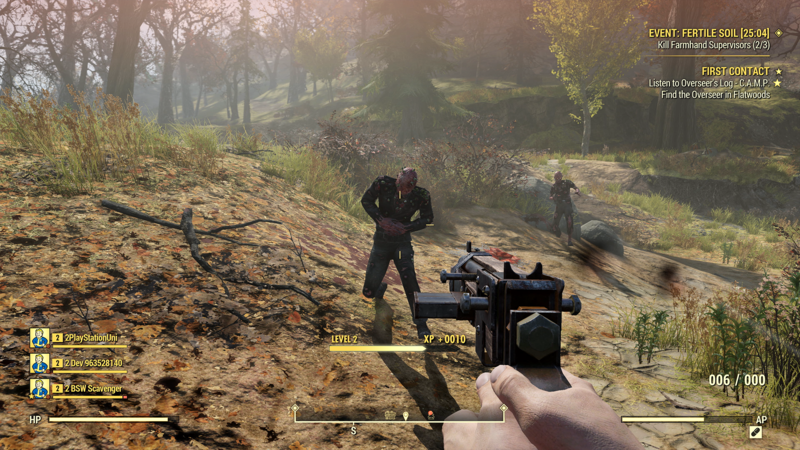 In a recent featured article on the official Fallout website, we got a detailed look at how to deal with aggressive survivors in Fallout 76. For those eager to get their hands dirty, there’s Hunter/Hunted mode that can be accessed by tuning your Pip-Boy to the Hunter/Hunted station. Once at least four players have joined “you’ll attempt to hunt down a survivor- while eluding another for fun and prizes” in what seems to be a slow paced, smaller, and more methodical battle royale mode. Over time, the Hunt area’s size will decrease, forcing you closer to your current victim and assassin. Upon killing your target, you’ll be assigned to the player they were tracking, and so on, until just one Hunter remains. Win or lose, taking down at least one other Hunter will award you with some Caps and XP. These rewards will also increase based on the number of kills you achieve, up to a maximum of six kills. While the parallels to battle royale are clear (shrinking play area until there’s one player standing), Hunter/Hunted feels distinct in that it aligns with Bethesda’s approach when it comes to Fallout 76 being online only. When announced, Todd Howard stressed that it wouldn’t be filled with hundreds of people. The small size of Hunter/Hunted is in keeping with this tone. At the same time, you don’t need to fight others much at all during a standard play session. All damage you deal to another player is greatly reduced unless they respond to the attack. If you keep persisting and kill them, despite your target ignoring you, you’ll get a bounty on your head. If you’re not in the mood to spar, and another dweller refuses to back down, you can use the Block or Block for Session options to end communication with them and make it very difficult for them to find or follow you. But if you do decide to take on a fight you can earn bottle caps equivalent to that player’s level, upon killing them. If you die at the hands of another player here are your options. How will you approach PvP when Fallout 76 releases on November 14, 2018 for the PlayStation 4, Xbox One, and PC? Let us know in the comments below.